“My mom knew I had a talent in the kitchen. I was about 19, and she said ‘why don’t you cook for us’. My mom was pretty smart like that,” laughs Scott Tharp, founder of My Family Tradition. 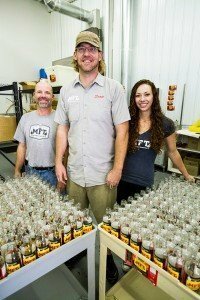 Scott Tharp, Jeff and Steve Bittick, as well as Janel Miles make up My Family Tradition, a Boise based barbeque sauce and rub company. Tharp and the Bitticks came together creating My Family Tradition more than 3 years ago, bringing with it two rich histories of family cooking. “My grandma came over twice a year from Germany. She had old school techniques,” says Tharp, whose grandmother was a big influence on his cooking style. “There was food all over the house when she came. She taught me that bread would rise differently downstairs in the bedroom in air that’s not moving than it would upstairs,” remembers Tharp. It was old techniques like this that helped inspire the barbeque sauce they make today. “She had a baseline tomato sauce that could become a number of things and that’s how our sauce came about, and this goes back 30 years,” says Tharp. Tharp traveled around the world playing basketball in college, picking up new cooking techniques in Hawaii, Ireland, Uruguay, and California as he kept cooking for people despite never being classically trained or employed in a restaurant. In college Tharp met Jeff Bittick, who also shared his love of cooking. “We were cooking before it was cool,” says Jeff with a laugh. 4 years ago Tharp approached Jeff about teaming up. At first Jeff resisted. His dad’s recipe had called for high fructose stuff and Jeff didn’t want to change. But eventually they succeeded in creating a rub that was true to tradition but all natural. “Everything is all integrated – perfectly fit,” says Steve commenting on the complementary nature of the rubs and sauces. Steve joined the team a little later, but has been helping ever since with everything from production to deliveries and taste testing. “The ingredients are only going to get better,” says Jeff. At MFT they take pride in the versatility of their products, developing seasonal items such as Nutmeg and Coffee rubs as well as always experimenting with new flavors such as Cherry Chipotle glaze. “We want to share with people how to cook with our sauces and rubs to bring cooking home again,” says Miles. 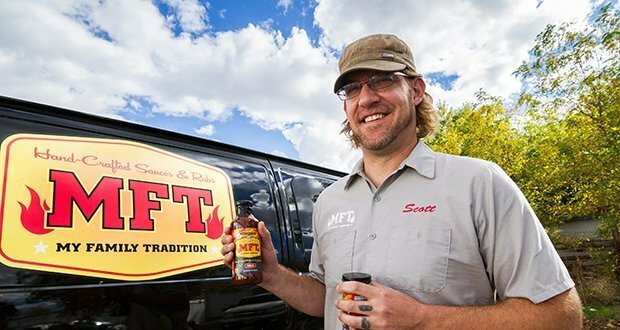 For more information about My Family Tradition and where to purchase their sauces and rubs, check out their website at mftsauceandrub.com or contact Janel Miles at 208-377-3055.